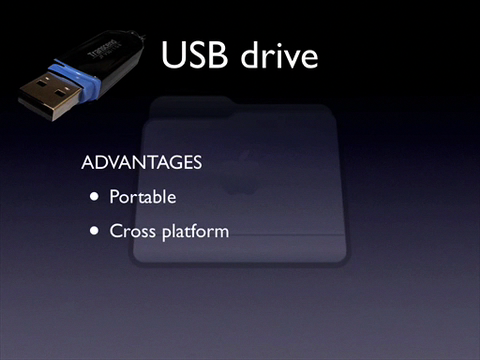 An overview of methods and strategies for backing up your computer to a variety of backup media. Click on the image to start. 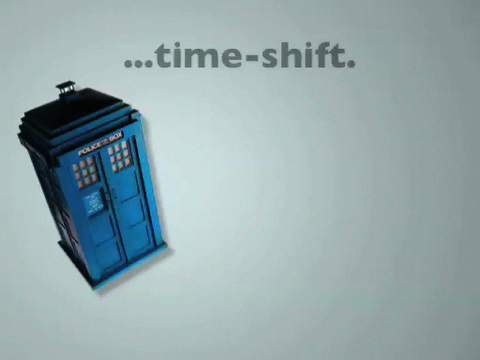 Here are some links to Atomic Learning videos about setting up and using Time Machine. If the links do not work directly, copy the 5-digit Key Number, launch Atomic Learning through MyUA, and paste the key number in the search box. What Do Teachers Need to Know About Technology? This presentation was developed for a colleague's education survey class. I was asked to speak on what teachers need to know about technology. I hope I made the point that what teachers need to know isn't so much about which buttons to push as it is about how to think critically about the context(s) for using technology as teaching and learning tools. This podcast explains how to upload a video from your computer to your Blogger blog. 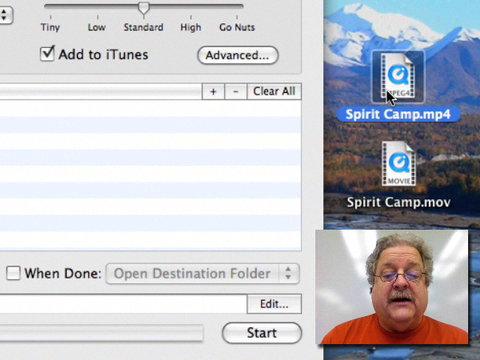 This podcast demonstrates how to get a video to play on your iPod, including using Visual Hub to convert the video to an appropriate format and moving the video to iTunes, and how to move the video from iTunes to your iPod. 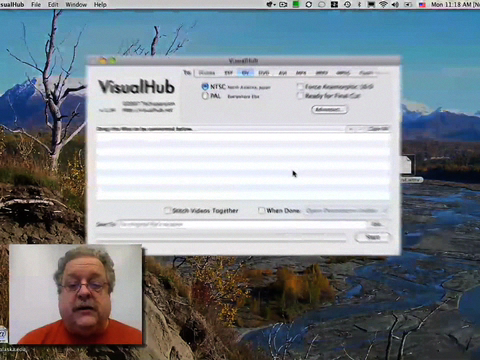 For more information on using Visual Hub, see Using Visual Hub to Convert Video Files. 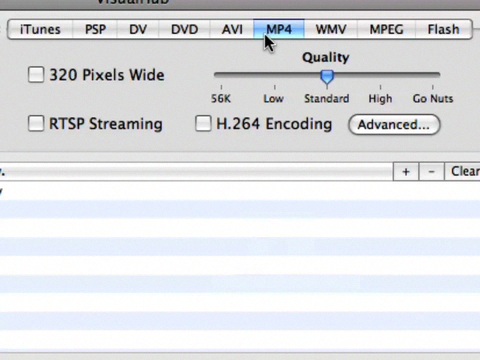 How to use Visual Hub to convert a video from it's source type to a video that can be played in QuickTime on your Mac. This podcast demnstrates two methods for uploading a video from your computer to YouTube--using iMovie 7 ('08) and uploading directly through YouTube. 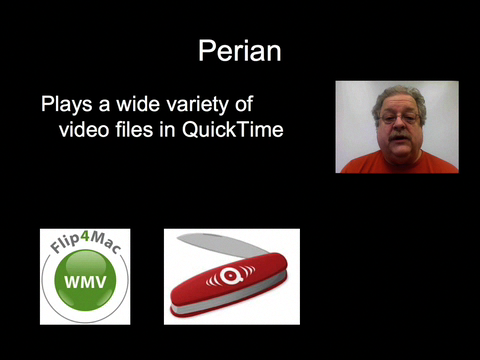 This podcast shows you three video utilities that you should have installed and updated on your computer--Flip4Mac WMV (plays Windows .wmv files in QuickTime), Perian (plays a wide variety of video files in QuickTime), and Video DownloadHelper, a Firefox extension that allows you to download videos from YouTube and many other online sources. A brief tutorial on installing and using Video DownloadHelper may be found on the RichMedia wiki. 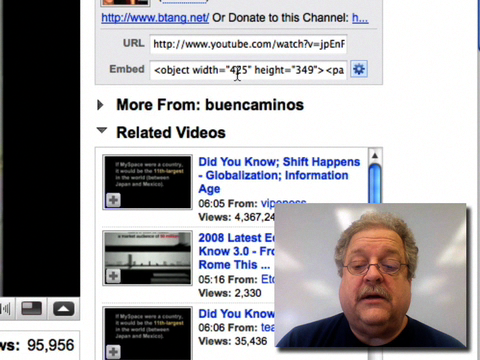 The podcast demonstrates the process of using a video from YouTube (or other online source) in a PowerPoint presentation. Included are the steps to download the video from YouTube using Video DownloadHelper, converting the YouTube video to .mp4 for use in PowerPoint, and finally inserting the converted video into PowerPoint. This podcast demonstrates how to embed a video from YouTube (or other sources) into Blackboard or into your blog (or any other web page that you can write to). This does not involve downloading or converting the video. 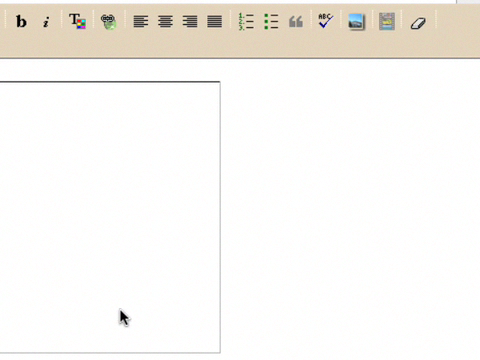 It simply shows you how to copy and paste the embed code into your web page--a highly effective way to display videos directly in Blackboard. 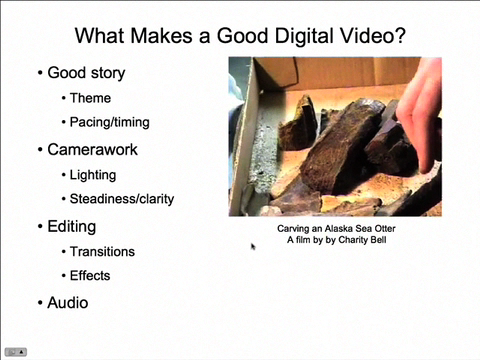 What Makes a Good Digital Video? In this brief podcast, we'll take a look at the elements that make a video an effective digital storytelling tool. At the end of the podcast is a short video, "Carving an Alaska Sea Otter," produced by a young person from Whittier, AK. After viewing the video, be critical of the Sea Otter movie in terms of how these elements were addressed in the video. By "critical," I mean to point out the effective elements as well as those that you might feel are lacking in some respect. Make sure to address each element (story, camerawork, editing, and audio) when you create your response. Your response will go into the class wiki and will be shared with the rest of the class members. Part Five of a five part series of podcasts explaining the use of Podcast Producer (Mac OS 10.5 "Leopard") to create and publish podcasts. Part Four of a five part series of podcasts explaining the use of Podcast Producer (Mac OS 10.5 "Leopard") to create and publish podcasts. Part Three of a five part series of podcasts explaining the use of Podcast Producer (Mac OS 10.5 "Leopard") to create and publish podcasts. Part Two of a five part series of podcasts explaining the use of Podcast Producer (Mac OS 10.5 "Leopard") to create and publish podcasts. Part One of a five part series of podcasts explaining the use of Podcast Producer (Mac OS 10.5 "Leopard") to create and publish podcasts. Atomic Learning is a rich, diverse source of instructional video for a wide variety of technology tasks. We are able to provide this resource for all of our faculty, staff, and students. This video provides a simple introduction to Atomic Learning. In this seven minute podcast, I have attempted to build a case for podcasting in a post-secondary academic environment. By thoughtfully selecting appropriate material to podcast, instructors can provide students with a flexible and efficient method for accessing material for preview, review, and repeated study using a medium that is comfortable for students.